La Gavaudiere is situated in its own 19 acres of land surrounded by woodland . Property 1: La Gavaudiere is situated in its own 19 acres of land surrounded by woodland . 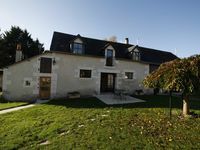 Very pleasant and peaceful gite in the countryside. The hosts are gracious. There is a nice swimming pool as well as other amusements , especially for children. Our cottage was charming and clean. It was a perfect place from which to take day trips to the Loire Valley, and then return to a quiet area. Nearby towns and markets are very accessible. We enjoyed our stay very much and would highly Recommend it to others.